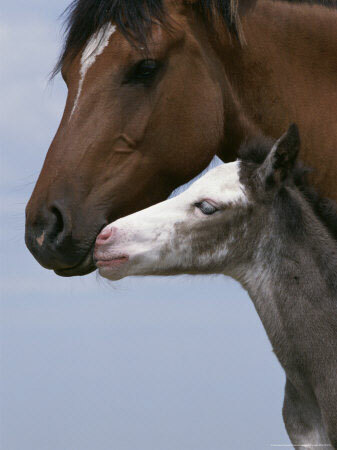 Baby horses up to one year old are know as a foals regardless of whether they are male or female. 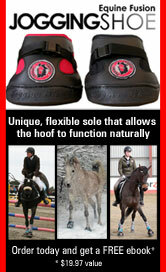 The term filly is used to describe a female horse who is less than four years old. Once they hit four, female horses are referred to as mares. Intact male horses under four years old are know as colts and over four years old as stallions and gelded males are known as geldings. Foals are very cute - here are some irresistible photos of foals. This adorable foal is a Gypsy Vanner foal. This breed originates from the United Kingdom and is know for it's strength and beauty. Gypsy Vanners are often black and white or brown and white and have long flowing manes and tails. They also have long feathers on their legs. 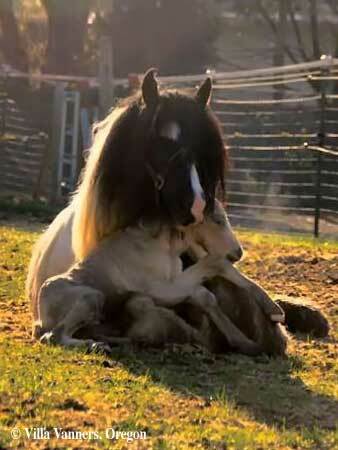 This foal is cuddled up on his mom's lap. The following set of photos of baby horses are available to buy as posters from AllPosters.com. Just click on the links to see the prices. 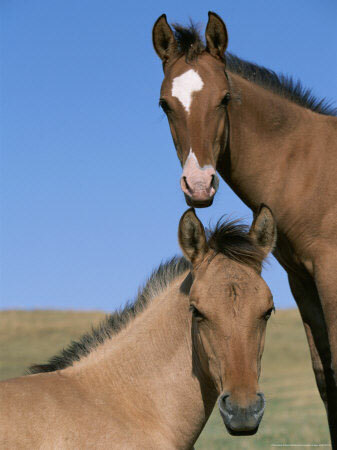 This poster features Two Spanish Mustang Foals. Mustangs are wild horses that live in wide open spaces in the United States. The foal on the left is dun colored (light brown with a black mane and tail) and the one on the right is a bay (mid brown with a black main and tail). 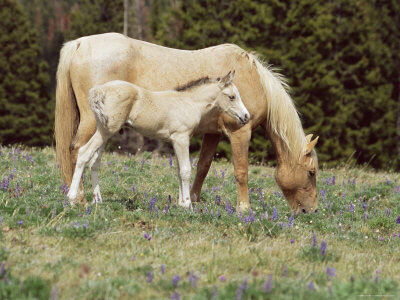 This foal is another Spanish Mustang and he is with his mother. Looks like he is giving her a big kiss! 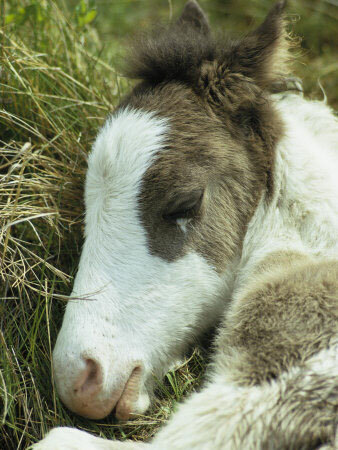 This foal is enjoying a nap in the sun in the Outer Banks of North Carolina. His color is called chestnut and his mane and tail are the same color as his body. This foal is a Mustang in the Pryor Mountains of Montana. 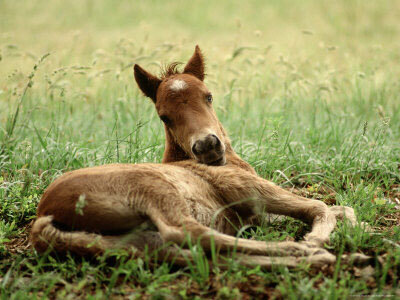 This foal is fast asleep and looks super cute! She is a paint (brown and white) and is very young. Or how cute is this? 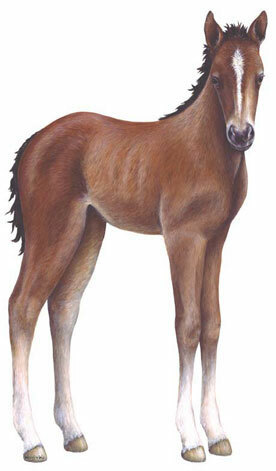 How would you like a life-size (24" wide by 45" high) sticker of a foal on your wall or door? These stickers are printed on self-adhesive, peel and stick waterproof vinyl they can be used both indoors and out on any flat, clean and dry surface. And what's even better is that they are removable and will not leave a sticky mess on the wall when removed. Click here to visit Critterwalls! Giant full-color wall decorations of your favorite animals. Use indoors or outdoors. Want to see more wild horse photos? Click here. 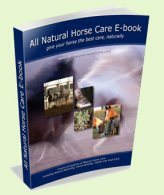 Downloadable eBook now available containing all the information on this site - over 100 pages - in an easy to print and navigate offline version. © 2006. All rights reserved. No part of this website may be reproduced without the written permission of the publisher and/or authors. The information contained within these pages is intended for educational purposes only, and not for diagnosing or medicinally prescribing in any way. Readers are cautioned to seek expert advice from a qualified health professional before pursuing any form of treatment for their animals. Opinions expressed herein are those of the authors and do not necessarily reflect those of the publisher.